There’s no getting away from it, so I might as well just get this over with straight away – olive oil in an ice cream sounds downright odd. Perhaps it’s the idea of an oily dessert, or maybe the combination of oil and cream that does it, but there’s something about the very idea of making an ice cream with olive oil in it that just doesn’t sit well. That’s an emotional and unfounded view, of course, and the logical part of me was prepared to accept that a good, fruity olive oil might just work for long enough for me to actually try to make it. The result is a triumph – there isn’t the slightest hint of greasiness to the ice cream at all, just a smooth creaminess with a punchy flavour, mild, savoury notes jabbing through the rich, creamy base. There’s a slight grassy flavour that sets this ice cream apart from the rest. Often, an ice cream is just something to serve next to something else that’s supposed to be better, but this is the other way round – the ice cream is the star of the show, and anything served with it a mere supporting partner. Keep it simple, in that case, nothing more than some fruit or berries, with a little sea salt cracked over the top of the ice cream to bring out the pepperiness of the oil. There’s nothing particularly complicated about the recipe, just remember that the oil is right at the heart of it, so it pays to use a very good olive oil, something that packs a real punch, with a big flavour and a bigger smell. Extra virgin, or not at all. Measure 330ml of whole milk, 100g of sugar, and a big pinch of salt into a pan and heat them together gently, stirring to dissolve the sugar. Pour 250ml of double cream into a big bowl, and six large egg yolks into yet another bowl. Ice cream making means washing up, I’m afraid … such is life. Whisk the egg yolks together, then pour the warmed milk over them to make a custard, whisking all the time to avoid the dreaded ‘soggy scrambled eggs instead of smooth custard’ scenario. Pour the custard back into the pan and heat through to cook, stirring constantly with a heatproof spatula until the custard coats the back of the spatula. Pour the custard through a sieve into the cream, and add 125ml of your chosen olive. Whisk until the olive oil is properly amalgamated, then stir the mixture to cool it down as quickly as possible. Placing the bowl in the sink with cold water that reaches about half way up the bowl helps. Chill the mixture until it’s properly cold, then churn in an ice cream machine. This is definitely worth a try. Don’t let the sound of the flavours put you off. It’s an odd combination, but it really works. 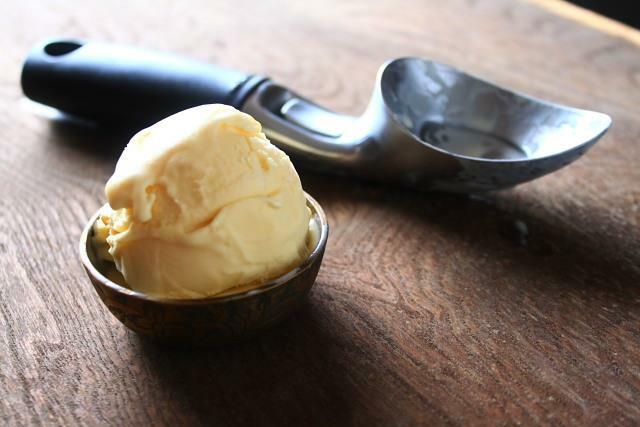 There’s another little trick that this recipe reveals … try drizzling the slightest amount of olive oil over a good vanilla ice cream, with a few flakes of sea salt. Outstanding, if completely unexpected. by David Lebovitz, and credit for the pun in the title must go to @italianclubnews. I have made and olive oil and Sauternes cake, which was interesting and also a very easy cake using mayonnaise! This looks worth a try, or at least the suggestion of drizzling vanilla ice cream with olive oil and sea salt. Thanks for the ideas. Ah, I have that David Lebovitz book, but must admit did not try this recipe. This post has got me seriously considering making it! Beautiful pictures.